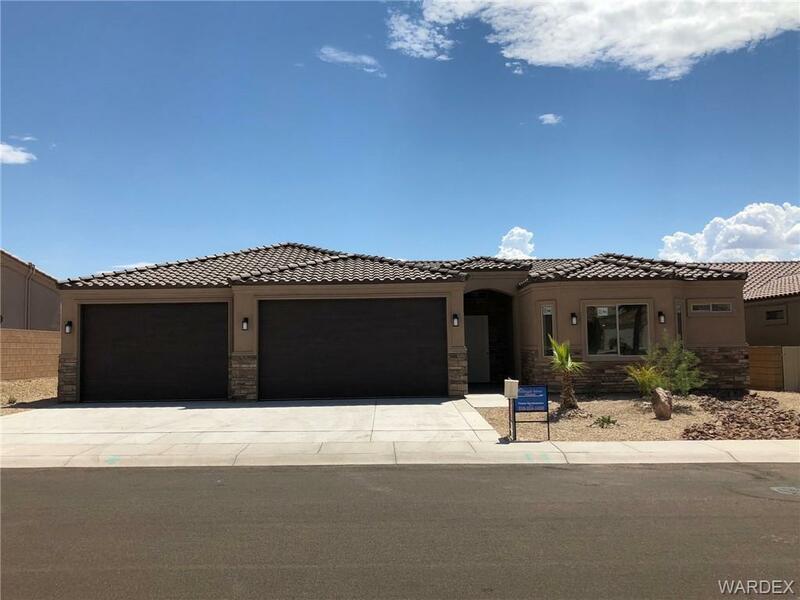 Live Bullhead City, AZ ~ Beautiful New Home ready for your personal touch.. This home has 3 Bedrooms, 3 Bathrooms plus a large Den. This home is Loaded with upgrades, must see to appreciate. Magnificent 10 ft ceilings, recessed lighting, and granite throughout. Large kitchen has stainless steel appliances, granite counter tops, a corner lazy susan, gas range, and a wine chiller. Bedrooms have carpet and the rest of the house is tile. Spacious master suite has large separate walk in shower with dual heads, jetted garden tub, double sinks, a large walkin in closet, as well as a 2nd closet. 2nd master has walk in shower and single sink. Block wall around yard and desert landscaping. Home features a 3 car boat garage with a 40 ft+ bay! Close to THE COLORADO RIVER, LAKE MOHAVE and THE CASINOS in Laughlin NV. Come and join us for fun in the sun on Arizona's west coast! !